His official name is Aydın Üneşi. He was born in 1961 in the town of Misirc (Kurtalan) in Sêrt (Siirt) Province. He graduated from the Department of Theology at Dokuz Eylül University. He had his master’s degree in the Department of Kurdish Language and Culture, within the Institute of Living Languages in Turkey at Artuklu University in Mardin. Between 1989 and 2000, he worked as a teacher for the Ministry of National Education. He opened the first official course in the Kurmanjî dialect of Kurdish in North Kurdistan. He taught the Kurmanjî dialect of Kurdish voluntarily in Batman, Silvan and Diyarbakır. 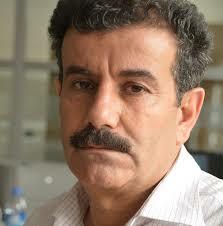 Between the years of 2011 and 2015, he lectured in the Kurmanjî dialect of Kurdish at Artuklu University. Newayî lives in Batman. Merdan Newayî’s literary writings and various articles in the Kurmanjî dialect of Kurdish have been published in newspapers and magazines such as Azadiya Welat, Rewşen-Name, Kevan, Tîroj, Nûbihar, W, Ajda, and Zembîlfiroş.